Add some comfy contemporary style to your home with buttoned-up Brighton. Select the size to suit from a large variety. Brighton is a classic retro modern style. Slim smoked oak legs, squared-off arms and deeply buttoned backs give the Brighton range its inviting looks. Smart, fresh colours are included in the upholstery choice, and the textured weave is soft to touch. Made to last and to look good for longer, foam filled seat cushions give comfort and shape retention, and fibre filled back cushions have sink in luxury. There are also two slender, buttoned bolsters each end, as well as accent scatter cushions with a toning geometric design. Brighton is available in a large variety of sizes. Three sizes of sofa – four, three and two seater – an armchair, loveseat, accent chair and large footstool. The accent pieces can be upholstered in the main colour or accent fabric. Most exciting of all might be the lounger, a three seater sofa with extra footstool on one side. The seat cushion covers both sofa seat and stool, making a large lounging space. By sliding the stool along and swapping the end seat cushions, you can lounge on the left or right hand side of the sofa. 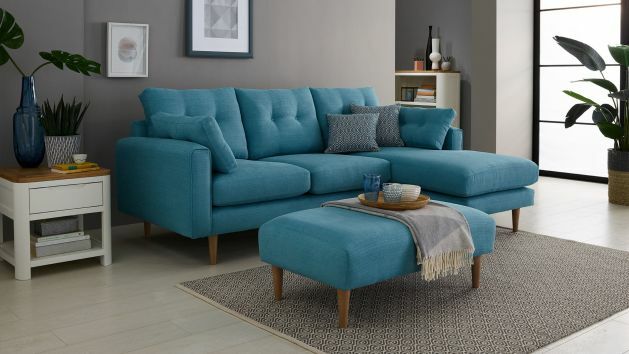 Add some comfy contemporary style to your home with buttoned-up Brighton – simply select the size to suit.